“Why? What are the markers?” asks Williams. This is a bit of a pet issue for me, as for years–as soon as I figured out what it was–I’ve believed I have Asperger’s Syndrome*. I’ve never put in the effort to seek an official diagnosis (although I’m getting closer to doing so for several reasons), but knowing the heredity nature of ASD, and then having a son with autism, I’m pretty sure of my self-diagnosis. Seinfeld sparked a nerve. Several people have suggested that a self-diagnosis isn’t really sufficient (although quite a few autism advocates point out that self-diagnosis is usually the method for diagnosis in adults–usually it is what spurs someone to seek an official diagnosis). Others suggest that a millionaire comedian can’t possibly be autistic. Others are concerned that fitting someone who is as successful as Jerry Seinfeld into the spectrum, with what assuredly must be a relatively mild form of autism, devalues the much more severe autism that many of their children face. I know. I get it. 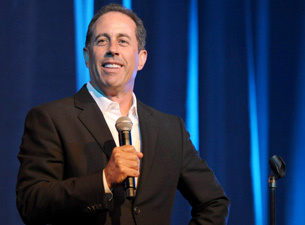 It’s hard to see someone as funny as Jerry Seinfeld, and think that he has issues with social communication. After all, how can someone who connects with so many people through his art be considered autistic? Comedy, for many people who are considered “misfits”, is a defense mechanism. It’s the “if I make them laugh they won’t beat me up” mentality. This is NOT a new statement about comedians. Comedy is usually predicated on seeing things differently than most people. Most people don’t find regular life funny. They just find it to be regular life. But our human experience in society is riddled with absurdities. I firmly believe that people on the spectrum, who can be over-literal and don’t often understand the subtlety of social interaction, can take an “outsider’s” view of regular life. For me, comedy is a highly intellectual affair. I love looking at jokes and trying to pick apart why they’re funny. I’ve worked hard to develop my sense of humor, largely through understanding other people, not through the normal method of picking things up naturally. As such, I absolutely hold that “outsider’s view” of comedy. The old Seinfeld trope, “What, is the deal, with that?” is the “outsider’s view” in a nutshell. He’s looking at everything we see every day, but through a completely different prism than we’re used to. Nor is autism a sign that someone cannot be successful. There are autism success stories all through society. Recently someone had suggested that Bill Gates fits many of the symptoms of autism, and he’s certainly no slouch. In fact, I like to think I’m one of those success stories. I honestly have trouble with social interaction. Yet I have a job that absolutely requires social interaction and relationship-building. In fact, I’m a manager of other people in my career. Many autistics don’t have successful romantic relationships. I’m married to a beautiful woman who is WAY out of my league. But it’s hard. Really hard, sometimes. I am where I am because I challenge the hell out of myself. I try to take those things where I know I’m not good at something and brute-force my way into making myself good at them. There are instances where it’s terrifying. At a recent conference, I knew I needed to approach a woman who was a marketing manager for a company we work with to discuss something that my company needed. I had to summon the courage to start a conversation with her, completely unprompted and without an introduction (EEK!!!). I forced myself to do it. For most people, that isn’t an existential victory. The fact that it is, for me, is a sign of my Asperger’s. As for that beautiful wife who is WAY out of my league? If she hadn’t approached me at a bar 13 years ago, I could very well still be single. In fact, one of the most important developments of our marriage has been my realization that I’m on the spectrum, and her acknowledgment of it. It’s extremely difficult for her to relate to me on several levels, but at least we both understand now where some of those blind spots are for me. It can still be difficult, but at least we’re now on the same page about the fact that we’re completely not on the same page! My success, or Jerry Seinfeld’s much larger success, shouldn’t be taken as devaluing the much more severe autism that many people face. What we’ve faced is an uphill climb, not a roadblock. I understand the concern of parents who have children with more severe autism, because I’m one of them too. My son, at 5, would still likely be considered non-verbal, even though he’s making progress. I desperately want him to have a chance in his life for the success I’ve had, but the largest fear I have in my entire life is that his autism will be a roadblock, not an uphill climb. A parent who hasn’t had to face that fear is a parent that I envy.